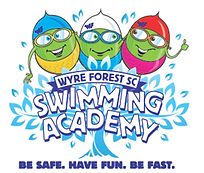 Wyre Forest Swimming Club’s Learn to Swim facility is part of the club’s Academy structure which teaches children from as young as 4 years old how to swim following the ASA Learn to Swim Framework. The club has been providing this service for decades and has had many swimmers progress through the various stages achieving their goals of swimming at Regional and National swimming competitions. Swimming lessons are held at King Charles I School, Kidderminster Monday to Thursday from 5.30pm to 6.30pm and Saturday from 9.00am to 1.00pm. Your child will be taught by the Learn to Swim Team consisting of qualified teachers within the club who are, or were, competitive swimmers from within WFSC who still have a passion for encouraging the next generation of swimmers. The Learn to Swim section of WFSC is being coordinated by Emma Elwell, who is herself an ex-competitive swimmer who started swimming at 4 ½ years old and has competed at many Open and League competitions over the years and gained valuable experience.